Preview images and official CW description for the Containment episode "Inferno"
The CW has now released three preview photos and an official description for “Inferno,” the Tuesday, May 31 episode of Containment. DON’T GET CAUGHT — With the cordon now under the purview of the National Guard, Lex (David Gyasi) finds himself clashing with Captain Lee Scott (guest star Miles Doleac), who is now in charge of the operation. 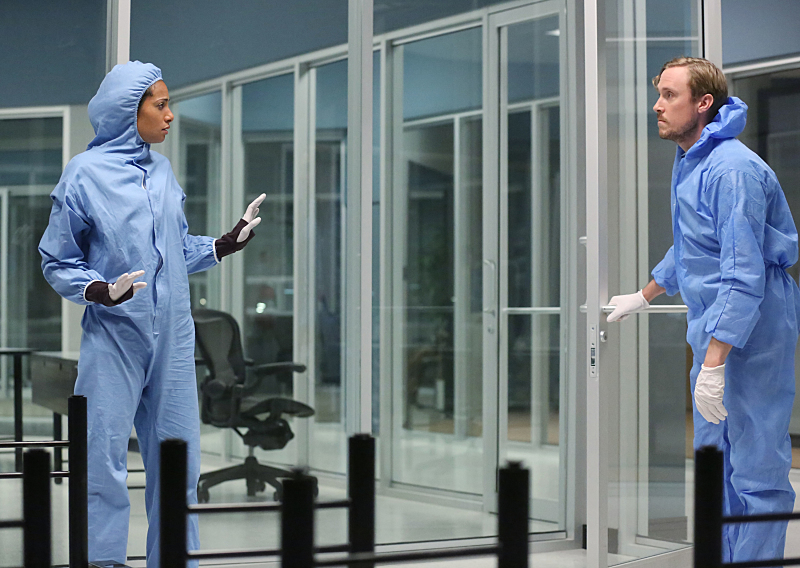 Inside the cordon, Jana (Christina Moses) steps up after the data recovery center comes under attack by a violent group of addicts looking for more drugs. Elsewhere, Xander (guest star Demetrius Bridges) and Leanne (guest star Tiffany Morgan) continue to disagree over Teresa (Hanna Mangan Lawrence) and the baby’s best interests, while a desperate plea from Jana leaves Lex’s world turned upside down. Chris Wood also stars. David Boyd directed the episode written by Matt Corman & Chris Ord (#107). Original airdate 5/31/2016. You can find the new photos below. Browse KSiteTV for more Containment coverage! Containment -- "Inferno" -- Image Number: CON107a_0035.jpg -- Pictured (L-R): Christina Moses as Jana and John Winscher as Tony -- Photo: Quantrell Colbert/The CW -- ÃÂ© 2016 The CW Network, LLC. All rights reserved.